Highest serial number on a Haenel 28R seen? Re: Highest serial number on a Haenel 28R seen? I would recommend using round ball shot as I've heard that regular pellets jam up the loading mechanism. None of my boxed repeaters came with any pellet containers. 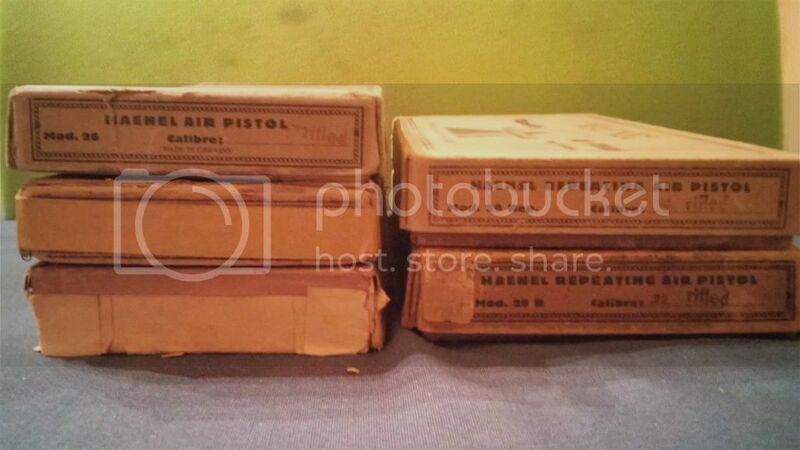 The instructions in the box lid reference loading 15 pellets for .22 cal. and 20 pellets for .177 cal. The picture in the lid actually shows a pellet and not round shot. USAF25 wrote: I would recommend using round ball shot as I've heard that regular pellets jam up the loading mechanism. None of my boxed repeaters came with any pellet containers. The instructions in the box lid reference loading 15 pellets for .22 cal. and 20 pellets for .177 cal. The picture in the lid actually shows a pellet and not round shot. MIne arrived about 2 hours before we took off for vacation so I really had time for a couple of tries but my standard pellets seemed problematic. Going to order round balls so they will be there when I get back. Modern pellets I think have long thinner skirts. I have a old pack of Hy-score pellets that came with my very early pistol and they seem much stouter. I'm not going to take target shooting too seriously with the Haenel so round balls will be fine. Just would like it to work. 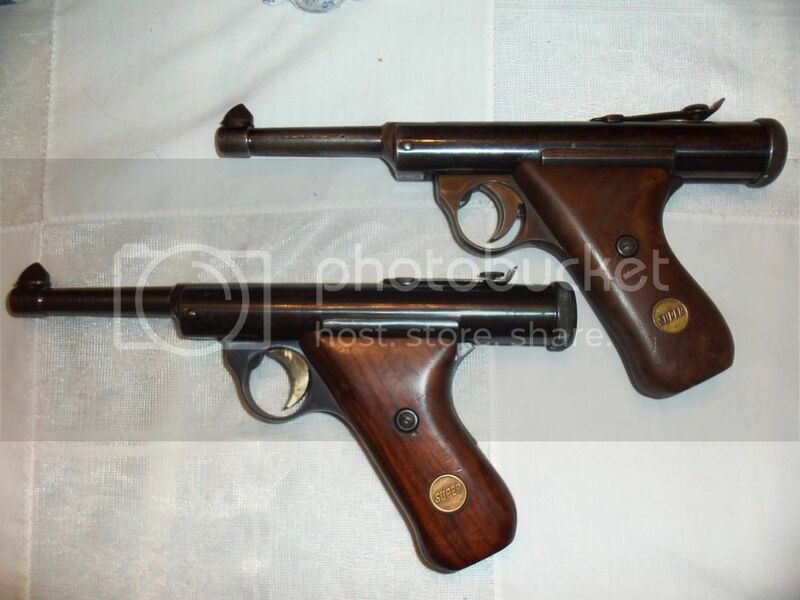 The gun is built with amazing quality, no different than a real Luger. I can see why these are collected. Could never be made today! USAF25 wrote: A few photographs, not the best. 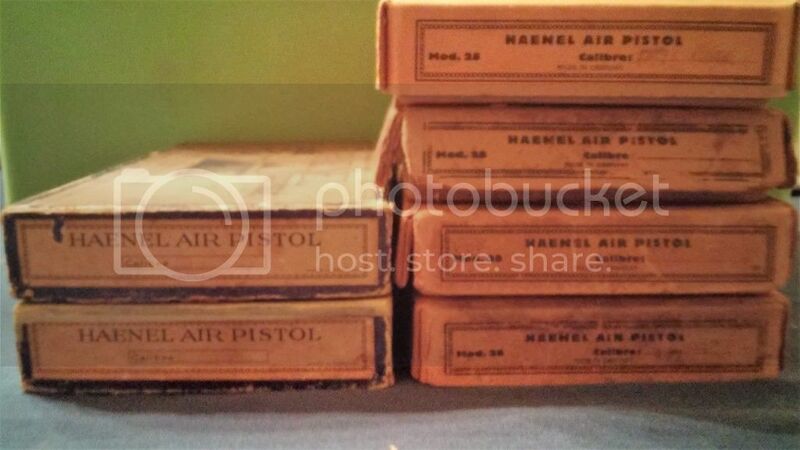 Through the years I have owned a number of Haenel air pistols, though my favorites are the Haenel Super MOD 28 and the Haenel Model 50 & 51. 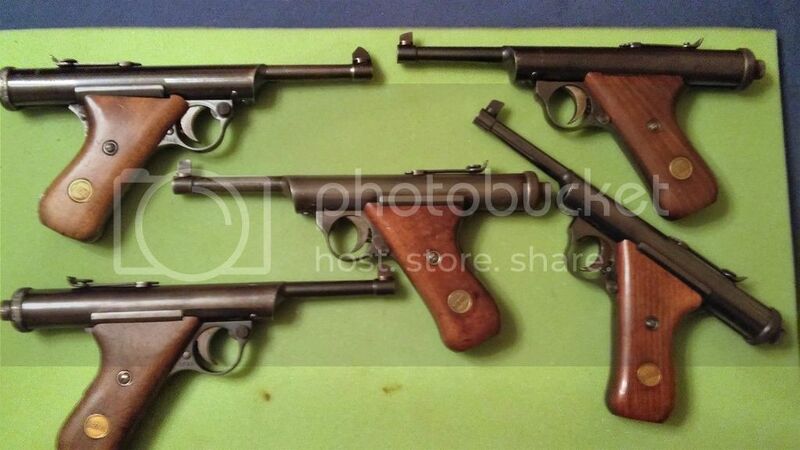 Some of my Haenel repeaters. It is always nice to find a boxed Haenel. I have found that the Haenel Air Pistol and Haenel Mod. 26 boxes are the most fragile. The Haenel SUPER MOD 28 are an uncommon variation of the Model 28. My research so far has determined that the serial number range on the SUPER version goes from #16755 through #16914. 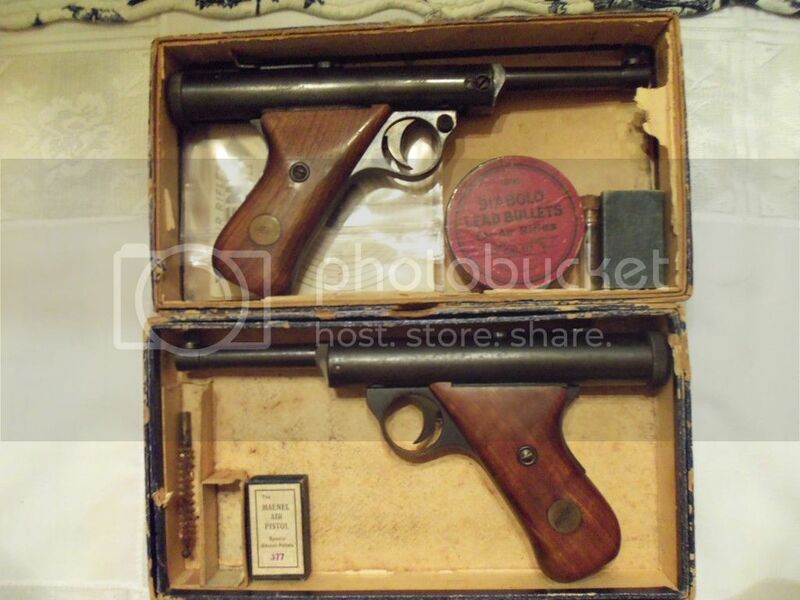 My only two boxed Haenel Air Pistols but a rare combination, serial #3449 & #3450, got them about 12 years apart. Brian thank you for the serial number, very much appreciated. Hope you enjoy the pictures, Bruce Jr. I have just acquired my second 28-R and both of mine have the short curved front sight. I see that in Bruce's collection all but one have the higher straight sight. I assume the higher sight is earlier and they progressed to the curved one. My 28-R serial numbers are in the mid 2500 and low 3000s. Wonder about when it changed. Trivial but curious.